Anecdotal evidence suggests that people coming into contact with cattle while participating in outdoor pursuits can sustain severe, even fatal injuries. This has negative implications for farmers, cattle and the public. This study outlines findings from a review of published literature, UK media reports and internet guidelines currently available to the UK public for walking near cattle. A total of 54 cattle attacks were reported in the UK media from 1 January 1993 to 31 May 2013; approximately one-quarter resulted in fatality and two-thirds involved dogs. Walking with dogs among cows, particularly with calves present, was a problematic context. Twenty pieces of commonly occurring advice were found within various guidelines. However, there are no definitive approved guidelines, no published studies describing the prevalence of cattle attacks on members of the public and no system in place to document them. Attacks by cattle are underinvestigated and further work should assess their public health impact. There are approximately 300 000 UK farms5and 9.7 million cattle.6 Public rights of way cross farmland including livestock grazing, so that while walking people come into contact with livestock, particularly cattle, and may have limited knowledge of how to behave around them. Risk assessments and mitigation measures are increasingly implemented to manage risk, but intensive attempts to govern human/cattle interactions would have negative implications for farmers, cattle and the public. Likely risk-management practices include removal of herds from publically accessed fields during peak seasons or restricting public access, and euthanasia of cattle that have attacked walkers. These could affect animal welfare via husbandry and farming practices, and financially impact farmers. Further, they could reduce public motivation for countryside outdoor activities. Thus, it is important to fully evaluate the scope of this public health problem. The aim of this project was to assess available information about negative interactions between the public and cattle, to identify risk factors for cattle attacks, and highlight the availability and usefulness of guidance on walking among livestock. The study outlines the findings of: (1) a literature review of published research; (2) a review of media reports; (3) an internet search of guidelines for countryside walking. Search terms for sets of searches were developed by iteratively trialling popular related phrases found in the published literature, media reports and using internet searches, until the most commonly occurring search terms were identified. Using this method, ‘cow’ for example was identified as being more commonly used than ‘cattle’, and sufficient to return all findings also related to ‘cattle’. The searches were conducted by a single author. Relevant published literature in English was identified using searches of SCOPUS and Web of Knowledge. Formal literature searches of ‘title’, ‘abstract’, ‘keywords’ and ‘topic’ search fields were undertaken using the ‘(cow* OR bovine) AND (attack OR injury)’ search term, to May 2013 inclusive (figure 1). 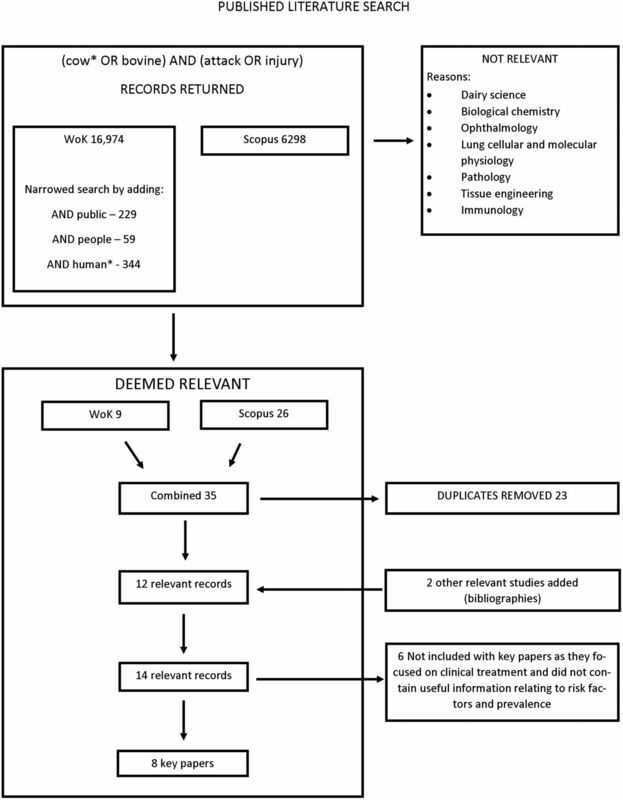 A schematic diagram of the search phrases used with the SCOPUS and Web of Knowledge (WoK) bibliometric databases, including the number of records returned during a search of published literature relating to outcomes and risk factors of cattle attacks on people undertaking outdoor pursuits. Media reports from the UK newspapers describing cattle attacks were identified by searching Lexis Library (1993 to May 2013 inclusive) using the search phrase ‘(cow* OR bovine) AND (attack OR injury) AND (walker* OR public)’. Current publically available internet guidelines describing best practice for walking among cattle were identified by searching Google, timespan unrestricted, UK pages only. The prepiloted search terms included: guidelines for walking through fields with cows; walking through fields with cows; cattle in fields crossed by public access; walking a dog through fields with cows; dog walking in cow fields. One thousand records were identified, 100 of which were relevant. Of these, 11 were duplicates, leaving 89 records (see online supplementary data). From January 1993 to May 2013, 54 separate cattle attacks were reported involving the public walking in livestock areas (figure 2): attacks peaked at 13 in 2009, of which nine occurred in May and June. Thirteen (24.1%) attacks resulted in walker fatality, with a peak of four in 2009. Reported walker injuries included fractures to arms, ribs, wrist, scapula, clavicle, legs, lacerations, punctured lung, bruising, black eyes, joint dislocation, nerve damage and unconsciousness. The number of cattle attacks on members of the public out walking in livestock areas reported in the media between 1 January 1993 and 31 May 2013, characterised by whether attacks were fatal and involved a dog. Most (72%) media reports definitively stated the presence/absence of dogs during an attack: 35 (64.8%) involved one dog, and there was no dog in four (7.4%). Reports also described five cattle categories: herd/multiple cattle (n=26, 48.2%); single cow (n=12, 22.2%); cows and calves (n=11, 20.4%); heifer (n=4, 7.4%); and bull (n=1, 1.9%). Of the attacks, four were reported in more than five newspapers: one described an attack on David Blunkett, the former Home Secretary, who stumbled and broke a rib while releasing his guide-dog's lead; one described an attack on a veterinarian who was trampled and killed while protecting her dogs, who were thought to have sparked the attack; one described an attack on brothers, one of whom died and the other suffered a punctured lung while walking dogs; and one described an attack on a walker who required emergency neurosurgery. She had strayed from an obstructed public footpath to follow a diversion while dog walking; she picked up the dog after it startled cattle. Media reports suggest factors influencing the likelihood or severity of attack including: the context as well as the behaviour of the people, dogs and cattle (table 1). Descriptive investigation of the data also suggests that female members of the public may be more likely to protect their dogs, while males let them go (see online supplementary data). Sensational language is used throughout reports, with phrases such as ‘Cow attacks: “It looked like they wanted to kill him;”’15 such language depicts cattle as being dangerous and highly likely to attack at any point, while the walker is portrayed as blameless. Following three cattle-related deaths in 2009, the National Farmers Union provided new signage reminding walkers using public footpaths to keep dogs on leads, but release if chased or threatened by cattle.18 In October 2005, the Countryside and Rights of Way Act 2000 (CROW) was implemented across England19 giving the public freedom to roam without staying on paths; restrictions include keeping dogs on leads near livestock and landowners/tenants excluding or restricting access in certain circumstances. Walking with dogs and cows with calves were key features of this study; both recognised as risk factors in the published literature, newspaper articles and web pages. Often dogs drew cattle's attention, and owners picked up dogs rather than releasing them. Further, the enormity of the issue of cattle-related injury is unknown, although hospital records describe injuries mainly in animal husbandry and related occupations. This study confirms that walker injury from cattle is a public health risk worth future attention. There is no official documentation system, and it is likely that attacks are under-reported. Between April 1996 and March 2006, the HSE investigated 46 incidents,20 whereas the media review reported in this study identified 17 attacks, and at least one cattle attack requiring hospitalisation was not reported in newspapers nor investigated by HSE (Westgarth, personal communication). The lack of public concern about this risk is surprising considering the political and media concern over comparable animal-related injuries such as bites from dogs; however, cattle are not regarded as ‘members of the family’. 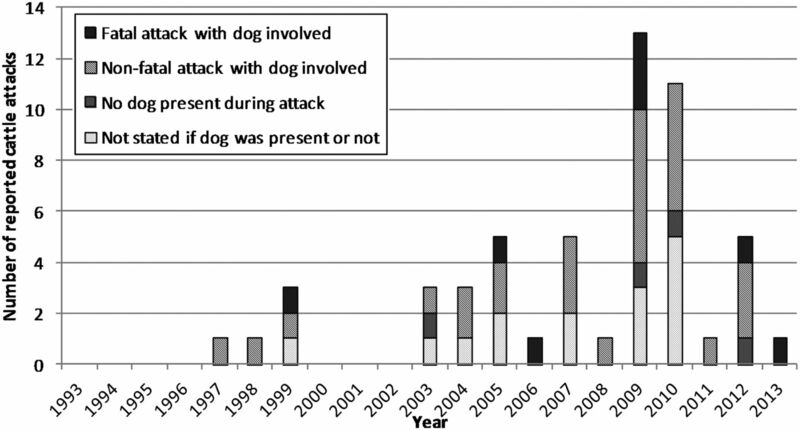 In conclusion, numerator information from cattle attacks gaining media attention are available but likely underestimate the true extent and no denominator information is available describing the number of countryside dog walkers; both are necessary to calculate the incidence of attacks and aid examination of risk factors. More research is required, in particular considering changes to countryside access and the promotion of physical activity for health. One possibility is the creation of a highly promoted central database, to encourage self-reporting of cattle attacks. Further, a generic approved guidance document in leaflet and web form would facilitate better management of this problem. Many members of the public walk or participate in other outdoor pursuits in the UK countryside and they often have dogs with them. There are anecdotal and hospital reports of cattle causing injury or death to walkers. Injuries from cattle are a significant and under-reported public health risk. Walkers with dogs are at particular risk. Guidelines of how to behave around cattle and avoid injury vary, in particular concerning control of dogs. Napier, New Zealand competed against 30 cities to win the 2016 WHO Western Pacific Regional Office Healthy Cities Recognition for Violence and Injury Prevention (Safe Cities). The city ‘demonstrated leadership and collaboration in the fields of, for example, crime prevention, road safety and reducing alcohol-related harm’. Comment: I have never been convinced the Safe City idea actually reduced injuries. But there is no doubting their hard work and dedication. Reduction in longevity following a traumatic brain injury? A Swedish study tracked the life trajectories of a large number of people who sustained a traumatic brain injury (TBI) before the age of 25. TBI victims had shorter life spans than their uninjured siblings and were nearly twice as likely to be hospitalised for a psychiatric illness before age 30. An editorial cautioned that it is not easy to draw a causal connection given the time period. CW's father, was hospitalised after being trampled by cattle in 2012. Thanks for the inspiration. Contributors CW and KMM conceived and designed the study. APF-W assisted with study design, performed the searches, data analysis and drafted the manuscript. CW and KMM revised the manuscript. All authors read and approved the final manuscript. Funding This study received no specific funding. CW is supported by a Medical Research Council Population Health Scientist Research Fellowship (grant number G1002402). Data sharing statement Summary data from the media report searches are available in the supplementary file.